Why do we need Error 451? Courts can order your Internet Service Provider to block certain websites. In the UK, this is usually because the websites contain material that infringes copyright. In other parts of the world, websites are targeted for their political content. ISPs often don't say why a website is blocked and court orders are rarely voluntarily published. So when sites are blocked, it's really hard to find out why. 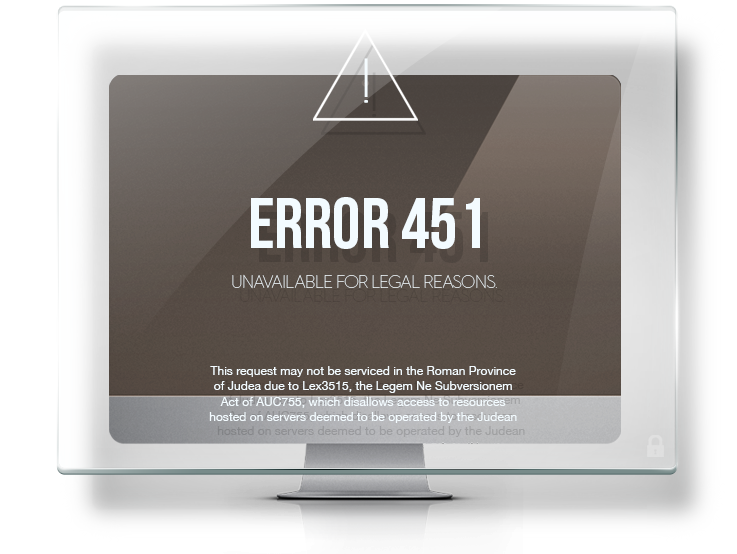 451 Unavailable is here to help ISPs make it clear why websites are blocked and to encourage courts to publish blocking orders. Can you help to make Internet censorship more transparent? We need your help analysing blocking orders, and making requests for missing orders. We need you to use and promote the error code, at your ISP, following our best practice. We need coders and documenters, and other help.